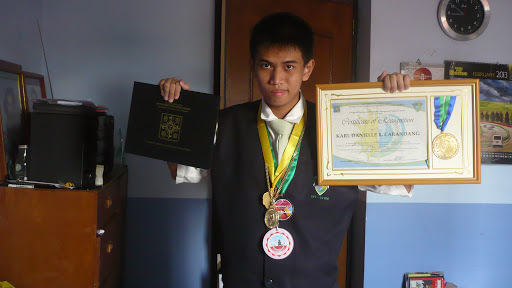 Tips on being a successful quiz bee competitor! A few months ago, one reader of this blog left a comment on this blog asking for tips on competing in quiz bees. However, I just read the comment a few weeks ago. I left my advice, but I have no idea if she was able to read it. So in this blog entry, since I’m a person who is happy to share things, I’ll give you some of my tips to be successful in quiz bee competitions. The most important of them all! You have to give everything you have whenever you’re up competing in these competitions. You must love the feeling of competing, as it is always an honor whenever you carry the name of your school. Few people are given a chance to do so, The drive must come from within yourself, not from the people around you. As proven in any endeavor in life, pursuing your passion will go a long way! 2. You don’t have to necessarily be the TOPNOTCHER to compete. Most of the times, those who are leading their classes will be picked to compete in quiz bees. Unfortunately, sometimes the lack of passion to compete in these kind of competitions leads to poor results in competition. On my own experience, I wasn’t in the Top 50 of our batch for the entire duration of my college life. Fortunately, my coach back then, did dug deep into our batch to find me. I even had the notion that there are a lot of people better than me to compete since on paper I’m not the best student around. Yet I seized the opportunity and the rest was history! If you’re in the same situation as I was, do seize the opportunity. There is always a significant difference between being good grades-wise and being good competition-wise. Of course, convincing your teachers is always important. You should come out to them and express your desire in competing. As long as you have #1 and the willingness to learn beyond the things taught in classroom. You will put up a good fight every time to compete. 3. Learn something NEW every day, go beyond the books in class! Yes! Questions that may come out on the quiz bee aren’t always based on textbooks or powerpoint presentations presented in class. It may come out from other sources. Keep yourself updated even on weekends! Go check out the news every single day and read other books that aren’t discussed in class. Who knows? It may come out come competition day and could be the difference from falling short or bask in glory. 4. Have the presence of mind to learn new things that you know will be tackled in your future studies. Say for example you’re a second year student, most of the topics in a competition per say will be topics you know will be tackled in either your third or fourth year of your studies. People would tend to be discouraged to learn things beyond their years. However, in the lead-up to the competition, you have to be ready to learn these things. Take every opportunity to learn these things. It will also be beneficial for you as you will gain an advantage in your class when you will be tackling these lessons/information you learned in training. 5. Your school academics is always a priority, yet devote enough time for preparing for the competition. Competing in quiz bees will never be a top priority over your academic performance in school. It is important to maintain a good standing in class. However, do allot enough time, time where you’ll be comfortable, where you will set aside your academics and prepare wholeheartedly for competing in quiz bees. 6. If you’re competing as a team, get to know each and every one’s specialties. In team competitions, in order to build team chemistry, you have to know to which parts your teammate is good at and things they need to improve on. Let them focus on the things they’re strong at, while you focus on all your assets. If there are some topics where every one on the team needs to improve on, learn it together! Doing things beyond training like going on a simple lunch together can do wonders to build team chemistry. I’m sure it applies to all aspects of life. Travel, Sports, Career, Business, etc. 7. In competition, savor the moment! Pressure kills and will be the difference between success and failure in competition. On competition day, come in composed, relaxed and see everything as you have nothing to lose! If you don’t win a place, that’s alright. Treat it as a learning experience for you to get better so you can come back next time swinging. Savor every moment! Imagine, you’re the one representing the hopes and dreams of an institution. Few people are given the opportunity to do so! If you got a question right, that’s great. If you got a question wrong, drop it right away but do remember it back after the competition. Getting a place is a bonus! Ending up as the champion is a blessing! What’s important win or lose is that at the end of the day, you know you put up a good fight! 8. Lastly, be thankful and stay humble! Be thankful to your teachers who gave you the opportunity to compete regardless if you win or lose. Be thankful to your family and friends who came out to support your endeavor. If you do win! You can enjoy the moment! Bask in the glory of your victory! But at the end of the day, be a humble pie. To those, who love to be in the same shoes I am, I do wish you all the best in all of your endeavors! Capping off the greatest ride of my life. I never saw it coming. I never expected I’d be embarking on what would become one of the best two day stretches of my life. Because prior to it all, I never expected that much. I knew I wasn’t able to prepare well enough for what I will embark and pursue to accomplish. But I know this will be my last ride, capping off a great run I had the past two years. Yet, for those two days, everything happened like it was a good night’s dream. It all began on a Friday, February 28 at the Our Lady of Fatima University campus in Lagro, Quezon City. I took a short bus ride from my home to get there, and it would be the first time I will meet the rest of the team who will be there with me competing at the 2014 UFTE Cup. In last year’s tournament, together with some of my classmates and batchmates, we competed at the Treston International College campus in Fort Bonifacio, Taguig City. 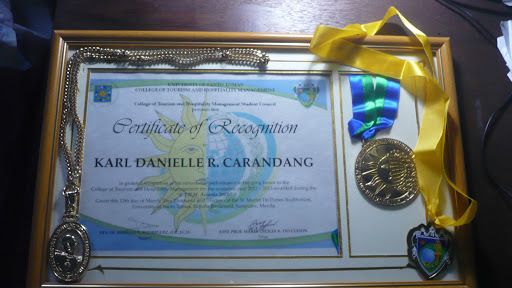 I finished second in the quiz bee competition, losing valiantly to a better man from De La Salle University-Dasmariñas. In the lead-up to the biggest final test I will have competing as an individual, I saw some familiar faces and saw new ones. Winning it all wasn’t in my head. I’d just wanted to put up a great fight. Then almost mid-day, the competition began. I fought against 28 fellow students from colleges and universities across the Philippines. It was a tightly contested contest, I didn’t knew where I am standing with the rest of them during the entire course of the competition. When the dust settled, the scores came out, and I won it! by three points over the lady and a good friend of mine from Lyceum of the Philippines University-Manila Lorraine Padilla who beat me in the PHILTOA Quiz Bee last year. I never saw it coming. It was an emotional victory for me as it was the first and only time I won a competition as an individual. Then more blessings came along for our team, as the Tour Packaging pair of Angela Sonico and Janelle Payumo from class 3T1 won also, while the Domestic Tour Guiding participant Danica Esquilona also from 3T1 won. While Dan Quiaoit and Miya Morelos put up a good fight in their International Tour and Kasuotang Pinoy competitions respectively. The cherry on the ice cream is that we won second place in the overall standings which was won by Lyceum of the Philippines University-Manila who won for the second straight year. Then the following day, with less rest coming into the next competition as the program last night finished unfashionably late into the night. I went in again, took a ride from home to the DENR Building also in Quezon City for the last competition I will embark on, the UP Club for the Environment & Tourism Domestikwhiz 2014. We were coming in as the defending champions where I was also a part of the team which won last year. The team this year, is a bit different from the team I started with the year, since both of them from the original team were unable to go since they were coming off a trip from South Korea. So I came in with a team composed of myself, Camilla de Guzman and Lia Tani both from class 2T3. This year’s competition is smaller than previous years as only 6 schools competed. We struggled out of the gates to start the competition, we had a tough time as our competitors gained ground on us. But we were able to do enough to get into the final round with 3 schools competing. We were happy that we will get a place at the end of the day, then in the final round, we made our move. We were able to recover all lost ground, when it all was said and done! We defended the title! It was a special feeling for me to defend a championship we won. We never saw it coming, yet we were there on top of the mountain once again! These would have not been possible without the help of the CTHM Administration led by Dean Tio Cuison, Sir Win Medina, Sir Granado as well as Fr. Roy Rodriguez our Regent who gave me the opportunity to compete not only for the college but for the university. To all my coaches over the years, Ma’am Connie Ang, Ma’am Tin Fajardo, Ma’am Amy Turaray, Ma’am Jane Devanadera, Ma’am Karla Colmenar for giving us the wisdom in all our endeavors during the times we competed, and a special mention to Ma’am Joreen Rocamora (who’s now in De La Salle Lipa) for believing in a guy who wasn’t even in the Top 50 of the batch to compete on the biggest of these stages. To all my classmates, my 4T5 family who have been there to cheer me on even if they’re not in body to be at all my competitions, to my fellow batchmates who will graduate soon, to the people who I joined this journey in, my teammates over the years Ate Kriskyn Cabrera, Ate Marian Buenaventura, Chamille Mercado, Miah Kogami, Camilla de Guzman and Lia Tani. To my family who supported me from the very beginning. And lastly, to God for all the blessings I got over this two-year stretch. So with all of that, the greatest ride of my life comes to an end. This has been Karl Carandang, competing for UST-CTHM signing off. The ride ends with a bang! The hardest lessons learned. Practicum, here I come. It’s official. The semester is in the books. I will say with a open mind and heart that this was the toughest and the most difficult semester I ever had in the 3 1/2 years of my Thomasian journey. It pushed me to my very limits. From the very tough start to the year to the huge effort I gave to recover and bounce back at the same time the balancing act I did between my academic life and pursuits when it comes to competitions outside of the university. It was also took a grueling toll on myself both physically and mentally as I went through a lot of things in every day of the semester. Even though this was the toughest semester I had and I fell a bit short on my goal for the semester, There are still things to cheer up about, I’m glad that made it through without any failures in all of my subjects both related to tourism as well as the few general education subjects we had to take this semester. At the same time, my winning ways continued into the semester with the two competitions I competed in. With this semester over with, my academic life in college comes to an end. Also, I will not be able to see my classmates on a regular basis as we will now carve our own paths in the next semester, as we will enter the workplace and the industry itself for Practicum. I still have one last shot to prove my worth and most importantly get the necessary experience I will need to work well in the industry I decided to work on. It’s going to always be a challenge, but I’m sure it will be all worth it. I will work hard and do good in wherever workplace I will end up with when the right time comes. At the same time, I will get ready for my last tour of duty in tourism competitions, as I will soon pass the torch to my current teammates. Seven semesters have come and passed, we’re all down to the last semester, our days as students are already numbered and on March 27, 2014. The Thomasian journey will come to an end and a new journey begins thereafter. Almost there to the finish line. Got to finish strong. My recent illness the past couple of days has been keeping me on the shelf, as much as I tried to come to school to finish the week off, the illness still bugs me today. Even so, I’m writing this entry today to regain my confidence back and to write again after a long hiatus due to my schedule loaded with a lot of schoolwork. Besides, I’m getting better with every hour. Picking up from where I left off, the journey through this whirlwind of a semester went through a massive detour once the results of the preliminary examinations came out last month, and it wasn’t a pretty sight as the struggles I endured during the first half of the semester finally showed up. Despite the setback, there is still another half of the semester to bounce back and recover. I’m not giving up and will give everything I can to finish the semester strong so that we can move forward into taking up practicum at a tourism establishment. In addition, once the preliminary examinations were done, my training resumed for the competition at hand which is the Final Round of the 5th PHILTOA Tourism Quiz Bee. The bad weather prior to the competition took out most of my training time as class suspensions came along the way. But, I just had enough training to get me prepared for the big day. Then on September 7, it all came down to one afternoon at the SMX Convention Center as I competed with 10 other contestants in the Final Round. I was happy that my family and friends were there to support me in the competition. It was a tightly contested battle, the questions as expected were pretty tough especially those involving manual computations. Apparently, I almost won the event. However, I ended up in 2nd Place since the champion was able to answer a difficult question which was worth more points. Despite that, I’m happy with what I achieved in this competition, especially the fact that last year, I didn’t made it to the Final Round and in the semi-finals this year, I barely made it through the Top 10. To quote Mr. Cesar Cruz, PHILTOA President: “Bumawi ‘tong bata na to.” “This kid came back.” The following day, I came back to receive the award and winnings that came along with the victory. With the competition through, it caps off my quiz bee competition run for the semester. As my last tour of duty for the team will continue into the next semester. More than a week later, I was given the chance to give back in what the college has given me over the past two year as I was given the privilege to be the quizmaster in the Tourism Quiz Bee competition in our college. It was also an opportunity for me to share my experiences to the contestants. It was a great feeling for me, that I get to be on the other end of quiz bee competitions where I got to ask the questions instead of answering them. Last week, three months of blood, sweat, tears and thinking caps came down to one week as the THORC Week (Thesis week) came along. The work everyone put into the past three months came down to this week which included the poster presentation and the thesis defense. Our group came through BIG throughout the week as we won third place in the Best Group Presentation category and fifth place in the Best Paper category. Afterwards, we started working on making adjustments to our paper and put it into journal format. In the UAAP, the UST Growling Tigers are back in the Final Four as they pulled off a huge victory on the last day of the elimination round against the defending champions Ateneo Blue Eagles with a 82-74 win. The win ended Ateneo’s title defense as their five-peat championship streak is snapped and they will miss the Final Four for the first time in 14 years. The Tigers will now face the top seeded NU Bulldogs who enjoy a twice-to-beat advantage in the Final Four. In the other bracket, the FEU Tamaraws and the DLSU Green Archers will battle in a virtual best of three as the first game will determine who will have the twice to beat advantage. The semester is winding down, and in a couple of weeks, we’ll be heading for our practicum. Graduation shots to be taken soon. We’re coming to the conclusion of what has been a great ride. Better bring everything I got, and lay it all on the line. Rise to the occasion as they say, it’s time to put into action. The monsoon gave me a chance to catch up on things. This is my 200th blog entry since I opened this blog over a year ago. It’s been almost two months since I last wrote an entry here. Never did I think, that I’m writing this one in the middle of the monsoon rains that is caused by the typhoon up north in Taiwan. Well, the rains caused suspension of classes which opened up time for me to write this one. So yeah, as the title goes, it’s time for me to catch up on some of the things that happened from the time I wrote my last entry almost 6 weeks ago. We start back on the week after the retreat, least did I expect that the lessons I got from the retreat would not kick in right away. I was hoping to come out swinging afterwards. But it wasn’t easy and I still had difficulty in catching up with things. But yeah, I was reminded that “storms” in our life will come after the retreat and so I calmed down and re-channel my attention on the important matters. 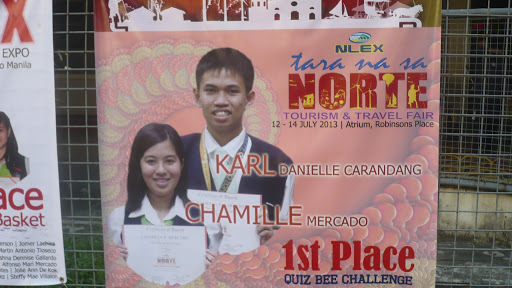 Then later in the week, another competition came along for me, the first one for the year which was the NLEX Tara Na Sa Norte Quiz Bee at the Atrium in Robinson’s Place Ermita Manila. I competed with a pair, which was my recruit from the third year Chamille. 9 schools competed in the competition. Well, it took awhile to finish the competition as there were a lot of controversies with regards with the questions. Despite that, it was a tightly contested battle. In the end however, we came out as champions by a mere solitary point. So we took home the cash prize of P5,000 which we later split as well as a certificate at the same time we had a celebratory meal at Yellow Cab. Then a couple of days later, our victory got put on a tarpaulin outside of our building. Driven by the recent victory, I slowly made my comeback bid a reality as I was able to find comfort in doing all the necessary schoolwork that I need to accomplish and I was able to contribute better in each project and homework that we have as the days progressed well until the end of the preliminary period of the semester. We also continued with our thesis work within the past couple of weeks. At the same time, my training continued as we prepared for the biggest competition in the semester and the most difficult and challenging quiz bee for the year which is the PHILTOA Quiz Bee exam, so it was me, Chamille and we were joined by Miah who was also a third year student. Then on August 7, we competed at the campus of Lyceum of the Philippines University in Intramuros. Just like the story last year, we all made it through the semi-finals. However, this version of the story had a change from last year. With my back against the wall, I was able to make it through withing the inch of my life to the Final Round on September 7 at the SMX Convention Center because I sat 9th out of the Top 10 that made it through to the Final Round. Unfortunately, my two other teammates were unable to make it through. Yet despite that, they gained experience in competing. We got something special coming up especially with more competitions lined up in the next semester. Meanwhile outside of the life at school, as one of the many hoop junkies in this country, at the start of August, Filipino basketball fans were in for a great treat as the FIBA Asia Championship was held here in the country as three spots were on the line to represent Asia in the FIBA Basketball World Cup 2014 in Spain. It was also an opportunity for Filipinos to come out with their full support for the national team which is famously known as Gilas Pilipinas. 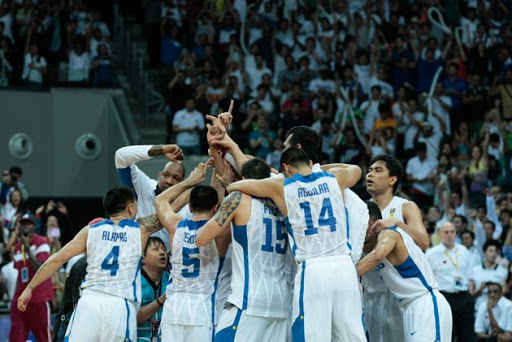 Filipino basketball fans were not left disappointed as Gilas was able to gain the silver medal which marked the first time the Philippines finished at the podium of the FIBA Asia Championship and secure a ticket to the Basketball World Cup for the first time since 1978 when the country hosted the event. From the early heartbreaking setback against Chinese Taipei, to the chants of “Puso”, “Laban Pilipinas” and “Gary” (David) that rained down at the Mall of Asia Arena, to the emotional semi-final victory against long time archrival-tormentor in South Korea, and giving the eventual champions Iran a good fight for the gold. This tournament will always be remembered by a lot of Filipino basketball fans of this generation. Unfortunately for me, I wasn’t able to watch a single game live at the Mall of Asia Arena during the duration of the tournament, at the same time I have yet to watch a UST game this season. I also made it a point that I won’t watch an UST-Ateneo game again this season as three of the four games I’ve watched live were this matchup. Also, the Philippines was visited by NBA players from LeBron James in July to Kobe Bryant in August. 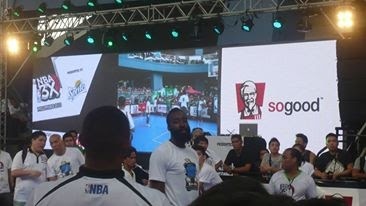 However, there was one event that I was able to come to and that was the NBA 3X event at the Mall of Asia Music Hall where I saw James Harden and Eric Gordon in person. 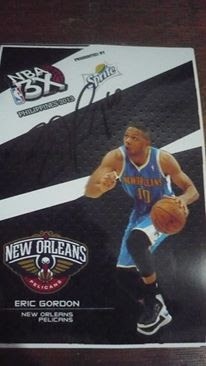 Fortunately, I was wearing an adidas shoe at the venue, and I was able to get a photo signed by Eric Gordon. Even though I didn’t end up with an autograph of Harden, I walked away happy and at least I got a photo of him. Well, there are still a lot of events coming up, from Derrick Rose coming over to Manila this September to promote for Adidas. As well as the anticipated NBA Global Games Philippines at the Mall of Asia Arena on October 10 as my favorite team the Houston Rockets will battle Eastern Conference finalists the Indiana Pacers in a fun match-up between teams that have loaded up their roster in the off-season as James Harden, Dwight Howard, Jeremy Lin, Chandler Parsons and the rest of the Rockets will battle the likes of Paul George, Roy Hibbert, George Hill, David West, Danny Granger and the rest of the Pacers. I’m fortunate that I’ll bear witness to history in the making as this is the first NBA pre-season game to be held in the country. As of this moment, our preliminary examinations has yet to come to an end due to the fact that classes have been suspended due to the inclement weather across Metro Manila and nearby provinces. We’ve already finished four days of exams which also included our mock defense for our Thesis. While some are already done with their exams like my younger brother also in UST, I still have to take two more exams. With every suspension, a day is lost in the preparation time for the competition I’ll be competing in next month, at the same time my fear that there will be classes come October 10 could come true. But then again, safety is above anything else and the fact that we should look after those that were affected by the widespread flooding. We’ll get through this tragic moment with our heads up high and the sun will rise again. Of course, I send my prayers to those who were gravely affected by the heavy flooding as well as the sinking of a passenger vessel in Cebu almost a week ago. Junior Year, thank you for all the memories. Hello Senior Year! Soon. A.Y. 2012-13 has come to an end. Junior Year, Third Year, Year 3 of my España journey has come to an end. Six semesters have come and go, time really flew by very fast. It was like yesterday when we lined up and hoped that we will get accepted into UST, now it’s down to one final year as a Thomasian student. But before all of that, here are some of the stories that I would like to share from the second semester of Year 3 of the España journey. Picking up where I left off the previous semester, I was back competing in quiz bee competitions for the university. I competed in three competitions this semester, all of which happened within a span of a month. 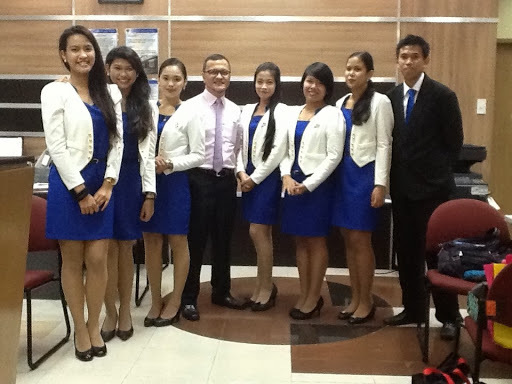 First was the 2nd National League of Tourism Students of the Philippines Skills Olympics Quiz Bee last February 9, 2013, where we went up north to the University of Baguio campus in the “City of Pines” in Baguio City. Our team topped the elimination round, however in the Final Round we were unable to duplicate our feat from the elimination round and we had to settle for 3rd Place. It wasn’t only us who competed there, my blockmates Jeanie Tan and Kimberly Tecson won 2nd Place in the Domestic Tour Package Proposal competition, while our fellow batchmate Rolando Sio Jr. won 1st Place in the International Tour Guiding competition. Also competing was another batchmate of ours Lyka dela Cruz who competed in the Domestic Tour guiding competition. At the end of the day, we did not go home empty. A week later on February 16, 2013, the team was back again to compete at the UP Club for the Environment & Tourism Domestikwhiz 2013 held at the Department of Environment and Natural Resources Social Hall in Quezon City. That competition also had a chip on our shoulders as it will be the last time we’ll compete as one team. As both of my teammates after the competition will prepare for their graduation. It was a tightly contested quiz bee. We thought we had lost it. However, we got a blessing as we came out as CHAMPIONS! It was the second time we as a team came out as champions. We won the cash prize of P6,000 which the three of us got to share with, medals for all three of us, a trophy we get to send back to España, and a Moonleaf planner for each of us (I would give mine in a raffle afterwards.) It was indeed a great way to cap off our run as one team with a BANG! 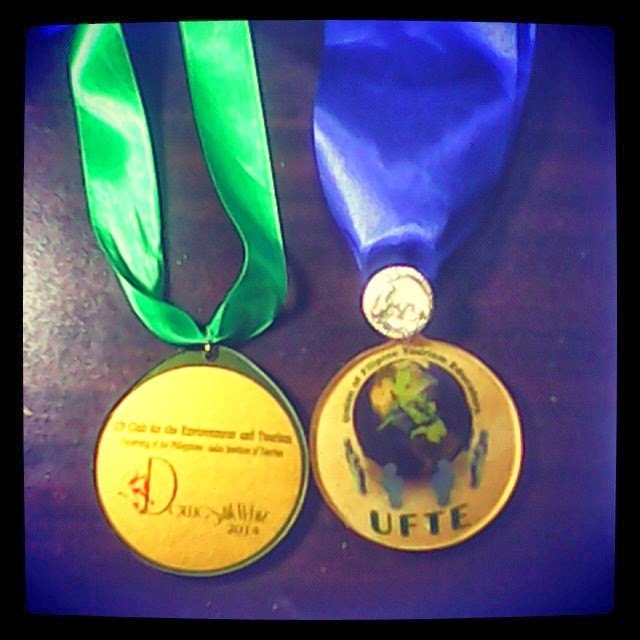 Finally on February 28, 2013, we went to the campus of Treston International College in Taguig City as we competed in the 7th National Tourism Students Congress Skills Olympics organized by UFTE/UFTS. It is the biggest competition of the year. This time however, I competed all by myself in the Quiz Bee competition. On that day was the elimination round for some of the competitions. As for me, I was able to get through to the elimination round as I finished second among the 11 who made it through to the final round. That day would turn out great as it wasn’t just me who got through to the eliminations, as all of us who competed that day made it through to the eliminations. Then the following day, March 1. We all came back, this time we brought along new faces who will only compete on that day. Then came the Final round of the Quiz Bee. It was a tightly contested battle, but in the end, just like in the eliminations, I settled for a runner-up finish. Aside from that, my blockmates Trudeece Ramos and Katlyne Bundal also won 2nd Place in the International Tour Package proposal, it was also a victory for our class 3T5 as all of us contributed to the success of the proposal in the competition. 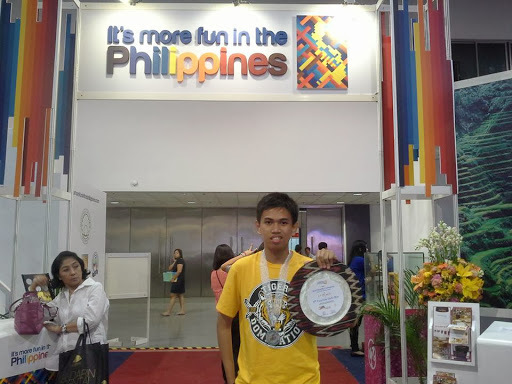 Then our batchmate Rolando Sio Jr. won 3rd Place in the International Tour Guiding competition. The others who competed were my blockmates Jeanie Tan and Kimberly Tecson in the Domestic Tour Package proposal, Shane Prepotente and Sheila Lao in the Poster Making competition, Trixia Alda who wore the costume designed by Justine Navato in the Kasuotang Pinoy competition and our batchmate Jhie Berbano who competed in the Domestic Tour Guiding competition. It was indeed a great way to cap off a great year of competition for all of us, and I’m so happy that all of us at 3T5 made a lot of noise this year through the competitions we competed all year long, and what great way to cap off the year was at the CTHM Awards 2013 held last March 12, when together with my teammates won the Benavides Outstanding Achievement Award as well as medals and certificates for bringing honor to the University and the College. 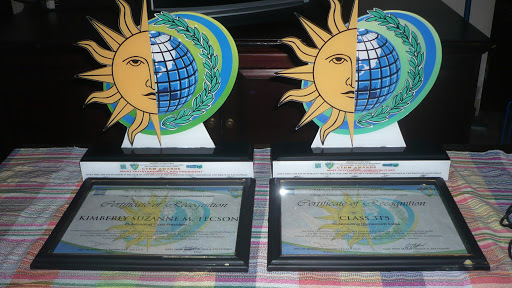 Not only that, our class 3T5 took home the Outstanding Homeroom Class Award for the Travel Management Department as well as the Outstanding Class President Award for our class president Kimberly Tecson. So for the last time, I’ll thank my senior teammates Ate Kriskyn Cabrera and Ate Marian Buenaventura. Being a part of this team has been a great honor and privilege. I’m happy we’ve achieved a lot of great things as one team. Congratulations as well on your graduation from the University. We’ll find time to hang out soon. Maybe this summer will do. You two may be signing off now with a BANG! We’ll continue what the three of us started together! Also I would like to thank our mentors from the Dean Ma’am Tioc, our chairperson (one-time class adviser) Sir Win and our secretary (also a one-time class adviser) Sir G for all the opportunity to represent the university in competitions this year. I couldn’t have asked more. I would also like to thank our coaches this semester, Ma’am Jane and Ma’am Tin for being there for us throughout the preparations until the competitions themselves. But let me not forget our previous coaches in Ma’am Connie, Ma’am Amy and Ma’am Joreen (who is now in De La Salle Lipa). I hope to come back next year better than ever and once again bring glory to the university. When I’m not in competitions, I had to go through the every day life of a Thomasian Travel Management Student. Our seniors always say that 3rd Year, 2nd Semester is the “most difficult” semester for a Travel Management student. Indeed it lived up to it’s word. From formulating a Business Plan/Feasibility Study in our Entreprenurship and Business Planning class which we were to defend in front of a panel of judges, it also gave us a lot of sleepless nights, but Thank God it came out better than expected. Also we had to go through writing booking files in our Galileo class which also comes with a shot at a certificate for the usage of the Galileo software. As well, to our French class which will be the last foreign language course we will take at the university, to our Statistics class with a twist, to our Tour Packaging class where we created an international tour package proposal and we used in competition, to the Tourism English class which was lively and very energetic, to the TTOM class where we went inside the basics of a travel company, and to the never forgiving Tour Planning class. Each subject gave all of us a set of challenges we had to endure over the past 5 months of the second semester. Most of the time, all was well, but of course there were times where we were pushed to our very limits. I’m really hoping with all the hard work that I gave all semester long, it will translate into positive results. Aside from the school work, there were a couple of events that happened around the campus this semester, one of which was the annual Paskuhan event which happened on December 21, 2012. The day they say the world will come to an end. But we’re all standing here at this moment in the year 2013 alive and well. But anyway, during the Paskuhan we all had a great time together with my classmates, batchmates and friends as we spent the entire night having a blast. Also, some of my classmates and batchmates went on an International Tour to Seoul, South Korea. Unfortunately, I was unable to come due to the high costs to make the trip. So while they’re away in another country, we still found a way to have some fun for us who got left behind in the Philippines as I threw a pizza party with my blockmates. Then, there was The Search for the Ideal Thomasian Personalities competition in which Mr. and Ms. CTHM came with a first runner-up and fourth runner-up finish respectively. Aside from that, the USTET results came out where the list of prospective Thomasians came out including those who were given a chance to an interview for a shot to get into CTHM. Also, there was the annual student elections both on the university-wide and college level. Finally, yesterday was the Baccalaureate Mass for the graduating students of the university as they passed by the Arch of the Centuries for the last time as Thomasian students. Next year, it will be us who’ll be passing by the Arch and sitting on those chairs. Yeah! So my third year as a Thomasian Travel Management Student has come to an end, and Summer vacation has arrived. It will be my last summer vacation as a student. I have to make this one count! The grades will be out soon, and once summer vacation has ended, it will be the start of Senior Year in my España journey. Thesis and then Practicum. Yeah it will be one busy Senior Year for me. But for now, I’ll savor the moment and relax over the hot summer heat. I’ll leave with a photo of mine with all the things I was able to achieve this year. JUNIOR YEAR, thanks for the memories. all in for the win. Thankful for every opportunity and chance to go all in. It all began last July, when I was called in to compete for the very first time. Seven months later, four competitions in tow, already tested and proven, battlescars all over. It all came down on this hot Friday morning in Taguig. It was my last competition for the school year. As I represented the university at the 7th National Tourism Students Congress Quiz Bee organized by UFTE and UFTS. But before all of that, on the day before probably, the biggest day of my life, with a team of 7 including 1 coach, we began our journey from UST to the campus of Treston International College in Taguig City. As we all had to go through the elimination rounds of the competition. With me competing the Quiz Bee, I was joined by my blockmates Jeanie Tan and Kimberly Tecson who competed in the Domestic Tour Package Proposal, Trudeece Ramos and Katlyne Bundal who competed in the International Tour Package Proposal. We were also joined by our batchmates Jr Sio who competed in the International Tour Guiding competition, and Jhie Berbano who competed in the Domestic Tour Guiding Competition. Accompanying us was our coach/mentor/mother Ms. Jane Devanadera. When all was said and done, we all came home happy as all of us made it through the eliminations and we‘re all coming back tomorrow to compete in the Finals. I finished second in the elimination round of the Quiz Bee. Three points separated me and the one who topped the elimination round. While the others did a very good job in advancing to the Final Round. Aside from that, we saw some of our former mentors like Ms. Joreen Rocamora who is now in De La Salle Lipa and is one of the reasons I was able to get this far and the one who believed and gave a lot of faith and confidence in all my abilities, as well as Chef Ayie Cordova who is now in FEU. Also, as the inner hoop junkie kicked in, I was thrilled to see the San Mig Coffee Mixers starring James Yap, Marc Pingris, PJ Simon, Joe Devance, Coach Tim Cone, among others, and I also got to see GlobalPort’s twin towers of Japeth Aguilar and Alex Crisano on the elevator. Too bad I did not have a camera with me so I was unable to take a picture with them. Then it all came down to that Friday morning, with the seven of us back to compete, we were also joined by three of my blockmates, Shane Prepotente and Sheila Lao who competed in the Poster Making competitionand Trixia Alda who modeled the work of Justine Navato in the Kasuotang Pinoy competition. Aside from them, members of the Students Tourism Society Executive Board also joined us with Brandon Esperancilla and Korine Sanchez. At around 11 am, together with 10 of my competitors in the Final Round, I stepped into the stage, took a seat, prayed for one last time, and the Quiz Bee began. It was a tightly contested competition, but in the end, I came very close to victory. I would settle for a runner-up finish. Four points separated me from the champion, while the one who finished thirdwas also four points behind me. Afterwards, I congratulated the champion who sat behind me as well as my other competitors for a good fight. The champion who I got to talk to afterwards came from De La Salle University–Dasmariñas, while the third placer came from Lyceum of the Philippines University-Manila. When the day was over, we also bagged in other awards. My blockmates Deece and Kat won second place in their International Tour Package Proposal of New Zealand which was a class effort by all of us at 3T5 who conceptualized the Itinerary, Costing, Marketing Video and Brochures that were used in the competition. Also, our batchmate Jr won third place in the International Tour Guiding competition. Jeanie and Kim on the Domestic Tour Package Proposal, Shane and Sheila on their Poster Making competition, Trixia on modeling at the Kasuotang Pinoy competition and Jhie on the Domestic Tour Guiding all did a good job and a valiant efforteven though they did not make it to the Top 3. Aside from that, we finished 4th Runner-Up Overall in the Skills Olympics which was won by Lyceum of the PhilippinesUniversity–Manila.Afterwards, we all went for one thanksgiving dinner in Chowking at the nearby Market! Market! So yeah, what has been a great year for me competing has come to an end. I competed in five competitions this year. The last three all came within a span of less than a month. Two championships, one runner-up finish, one third place finish and one semi-finals appearance. It was indeed a great and learning experience for me. I would like to thank all our mentors Ma’am Jane Devanadera who was a “motherly” figure to all of us through the last few days as well as Ma’am Christine Cabigao. Also, we would like to thank our families, our classmates (especially my block 3T5), our batchmates, and the entire CTHM and Thomasian community for all their support and prayers throughout the last couple of months in the journey we all took to this moment. Finally we Thank God for all the blessings and the inspiration you have given us throughout these past few months. It is indeed very overwhelming on my part to have made it this far from the time this all began last year. Next year, I wish I can play a part on improving our chances in winning competitions, especially now, I’ll be the only one left from our quiz bee team this year as both my teammates will be graduating this month. I took into heart what our mentors both old and new said over these two days in Taguig. Like every opportunity that I had this year, I hope I’ll get the opportunity once again to be a part of something BIG and bring glory to the university once again. That’s why I‘m saying to myself time and time again I’m all in for UST! Now, it’s back to reality for me as we wind down on this school year. There is plenty more work to do right now. Projects to pass, papers to defend, exams to pass, get certifications and all those things. For now, I’ll savor this moment. For tomorrow, it’s back to work again! Thankful and Blessed! Opportunities taken have bear fruit. 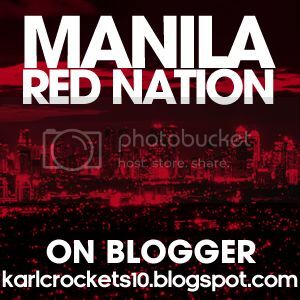 This blog is from the Philippines. ©2014 Karl Carandang All Rights Reserved. It's been awhile since I enjoyed a view of Manila Bay. Gonna be around for the next few hours. K-Smoove's Thought Ladder. A blogger who stands for what he believes in. Welcome to the thought ladder. Welcome to my personal blog called. "Never back down, never give up." In 2014, I decided to rename the blog with the current name you are seeing right now. "Manila" being the capital city of my home country, the Republic of the Philippines. "Red Nation" for the name of the the fanbase of my favorite NBA team, the Houston Rockets. Which I have been a fan for over 12 years. This blog is a storybook of my thoughts and dreams. I like to share my stories to each and every one of you who come by my blog. It tells a story of who I am and my the things I like to talk about in my life like the Philippines, basketball, travel, wrestling, anime, music, sports, and among other topics. Feel free to browse around and leave a comment on my posts. The return to watching them Tigers roar live. Got my life in check. A tearful adieu. The best team won the marbles. Lolo Kiko, Thank You for the inspiration. You’re the real MVP. "Most Valuable Pope"